This spring, Mel Chin, the Burnsville-based conceptual artist, is taking a team of interdisciplinary UNC Asheville students to Times Square in New York City to showcase “huge physical and augmented reality installations,” according to a UNCA press release. Chin is renowned for his socially conscious, grand-scale artworks, and the installations go live on Earth Day, April 22. 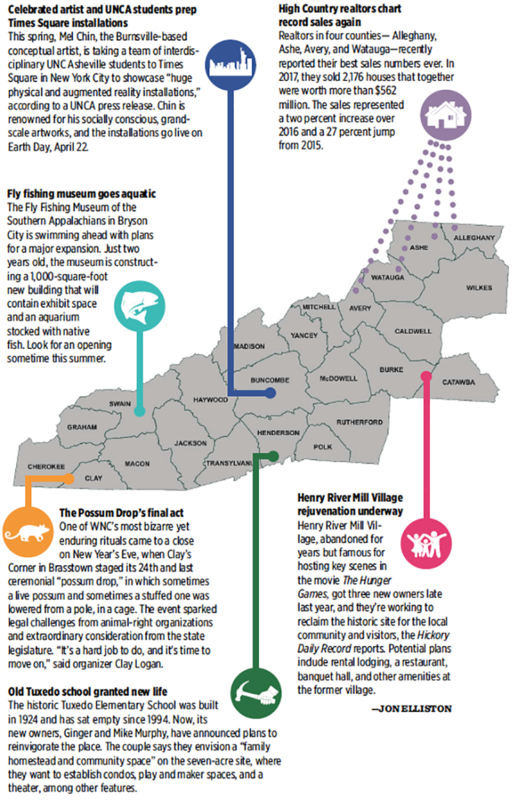 The Fly Fishing Museum of the Southern Appalachians in Bryson City is swimming ahead with plans for a major expansion. Just two years old, the museum is constructing a 1,000-square-foot new building that will contain exhibit space and an aquarium stocked with native fish. Look for an opening sometime this summer. One of WNC’s most bizarre yet enduring rituals came to a close on New Year’s Eve, when Clay’s Corner in Brasstown staged its 24th and last ceremonial “possum drop,” in which sometimes a live possum and sometimes a stuffed one was lowered from a pole, in a cage. The event sparked legal challenges from animal-right organizations and extraordinary consideration from the state legislature. “It’s a hard job to do, and it’s time to move on,” said organizer Clay Logan. The historic Tuxedo Elementary School was built in 1924 and has sat empty since 1994. Now, its new owners, Ginger and Mike Murphy, have announced plans to reinvigorate the place. The couple says they envision a “family homestead and community space” on the seven-acre site, where they want to establish condos, play and maker spaces, and a theater, among other features. Realtors in four counties— Alleghany, Ashe, Avery, and Watauga—recently reported their best sales numbers ever. In 2017, they sold 2,176 houses that together were worth more than $562 million. The sales represented a two percent increase over 2016 and a 27 percent jump from 2015. Henry River Mill Village, abandoned for years but famous for hosting key scenes in the movie The Hunger Games, got three new owners late last year, and they’re working to reclaim the historic site for the local community and visitors, the Hickory Daily Record reports. Potential plans include rental lodging, a restaurant, banquet hall, and other amenities at the former village.